4K/UHD OB Van for SBS in South Korea and NEP Switzerland. Bingen, Germany - May 2016: German based system integrator Broadcast Solutions GmbH announces two new orders for building 4K/UHD OB Vans for South Korean Broadcaster SBS (Seoul Broadcasting System) and NEP Switzerland, respectively. Both OB Vans are being built with the company’s Streamline OB Van family as the basis. The Streamline Family of OB Vans consists of pre-engineered OB Vans with short delivery time but without restrictions on quality and up-to-date equipment. 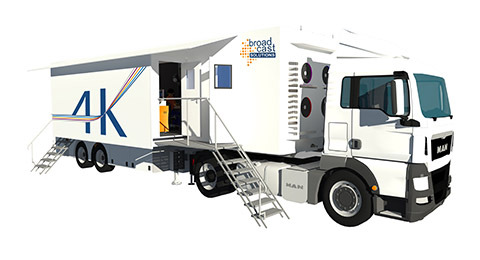 Of course all Streamline OB Vans can be delivered in a 4K/UHD model. The OB Van ordered by NEP Switzerland is based on the Streamline Family and can handle productions with up to 10 4K/UHD cameras or 16 HD cameras respectively. The video system works with the Quad Link 2 Sample Interleave (2SI) standard. Delivery to customer NEP Switzerland is planned for beginning of July 2016. The new production tool will be used mainly for UHD productions for the football Swiss Super League. Since 2011 former Mediatec Switzerland, now NEP Switzerland, uses Streamline S12 OB Vans for producing the Swiss Super League. The OB Van for South Korean broadcaster SBS works with up to 12 4K/UHD cameras on the basis of 12G-SDI UHD Single Link in combination with Quad Link 3G-SDI as well as hybrid IP-systems. This new OB Van is the first realization of the new Alphaline concept, which Broadcast Solutions developed on the basis of the Streamline Family concept. Since years, South Korea is on the forefront of adopting UHD TV. The countrywide establishment of UHD as the new standard was decided by government and a regular TV programme is already available. Since years South Korean broadcaster SBS and Broadcast Solutions share a long lasting relationship. Reliable local partner over the years is South Korean company Dong Yang Digital.